Water is Life. Life is Joy. That is the mantra by which the fabled Waturi islanders have lived on their Pacific isle for centuries. 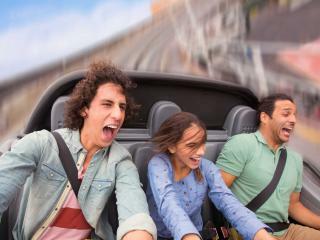 And now you can live the Waturi way at Universal’s Volcano Bay™, an all-new, adventure-drenched water theme park like no other, filled with both thrills and relaxing indulgence. Here, there’s no standing in long lines. No wrestling with tubes. No waiting for the fun to begin. Which means you spend more time drifting leisurely down a winding river, plummeting down a tropical volcano, catapulting into pools of blue water, and reconnecting with your family. 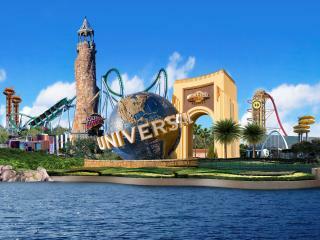 All just steps away from our other theme parks, Universal’s Islands of Adventure™ and Universal Studios Florida™ and Universal CityWalk™ dining, shopping and entertainment. TapuTapu™ Puts The Wonders Of Volcano Bay™ Right At Your Wrist. At Volcano Bay™ every guest is granted the powers of the TapuTapu™, a waterproof wearable specifically designed for the park. With just a touch of your wrist you’ll be able to hold your place in a Virtual Line™ at the rides and discover wondrous surprises. The namesake of Universal’s Volcano Bay™, this fiery landmark towers over the landscape, beckoning guests to the center of this lush, tropical island. Krakatu™ - At the heart of the island, the mighty Fire and Water Volcano towers 200 feet above the tropical landscape streaming waterfalls during the day and fiery lava effects at night. 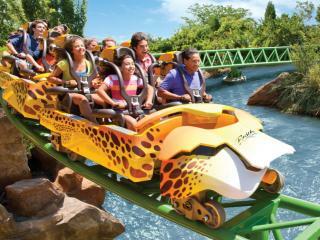 Inside the cavernous volcano, you will brave a variety of pulse-pounding water slides. Ko’okiri Body Plunge - Featuring a 70-degree fall through a drop door and 125 feet of screaming, white-knuckle fun, this dizzying descent ends with a watery tribute from the volcano god, Vol, himself. Kala & Ta Nui Serpentine Body Slides - Join Kala and Ta Nui where sea and sky meet and take a leap of faith from high atop the volcano. Twin trap doors simultaneously drop two guests down clear, intertwining tubes before sending them joyfully splashing into the turquoise waters below. Punga Racers - A favourite among Waturi children of all ages, Punga Races send single riders on their manta ray mats sliding down four lanes through underwater sea caves. Waturi Beach - Swim, splash and relax right along with them in the sparkling waters and warm waves of this sparkling lagoon at the foot of mighty Krakatau™. The Reef - Watch the bravest Waturi take the Ko’okiri Body Plunge from the comfort of this peaceful leisure pool. Its clear plexi tube shoots straight through this 5.5-foot-deep pool, which features its own private waterfall that’s perfect for frolicking. Honu ika Moana - Just like the ancient Waturi people who rode the ocean waves on friendly sea turtles and whales, guests can enjoy these two exciting slides in Universal’s Volcano Bay™’s River Village. Tot Tiki Reef - Even the youngest Waturi can get in on the fun in the shallows of Tot Tiki Reef. Play among splashy slides, a tot-sized water volcano and a tribe of friendly Moais who spray water from their blowholes. Plus, adorable whales spray and sing as kids raise and lower their hands. geysers, water guns, slides and dump cups. 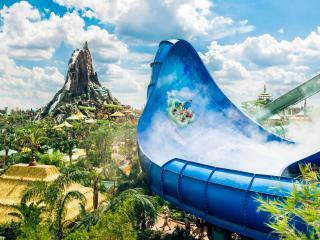 Wai Winding River - Take a slow ride on the Kopiko Wai Winding River through the tropical landscape of Universal’s Volcano Bay™, a land full of surprises. Sprays of water surprise along the way, and beneath the lava rocks, Stargazer’s Cavern reveals the magical night sky above. Taniwha Tubes - There’s a place in Universal’s Volcano Bay™ where the puka trees grow abnormally tall. Inspired by their twisting roots, the Waturi built four twisting water slides called the Taniwha Tubes. Riders can try all four twisting tracks, but beware – mischievous Moai statues spray jets of water when you least expect it. Maku Puihi Round Raft Rides - Is your group ready for the high adventure of the Maku Puihi lava tubes? This six-person rafting adventure is a favorite of Waturi families, but it’s not for the faint of heart. Choose one of two paths or try them both – just be ready for a thrilling ride. Puka Uli Lagoon - This pool features multiple elements that even the tiniest Waturi can enjoy like bongo drums and spraying water. TeAwa, The Fearless River - Up for an adventure? Take a thrilling whitewater ride along TeAwa, The Fearless River. Race along a roaring, watery onslaught of churning rapids and choppy waves while hanging tight to your inner tube. Ohyah Drop Slide - Test your mettle and get into the Waturi spirit by tackling the Ohyah Drop Slide. Ascend the side of a cliff before plummeting down the twisting waters of this slide, then drop out four feet above the pool below. Ohno Drop Slide - To achieve even greater bragging rights, brave the rope bridge and take the plunge down the Ohno Slide, a serpentine adventure that ends six feet above the pool below. Be sure to yell your battle cry on the way down.